Unless something miraculous happens, the St. Louis Cardinals will fail to sign Albert Pujols by tomorrow’s deadline.That means we’re in for a long season of speculation before Pujols signs his new contract next winter. There’s still a strong possibility that the Cardinals will finally hand Pujols a blank check when push comes to shove, and Pujols will remain a Cardinal for life. But if and when he becomes a free agent, Pujols will surely listen to pitches from other teams. We think the Chicago Cubs make the most sense as a potential Pujols employer, but we’d be foolish to overlook the most free-spending team in sports. The popular argument against the Yankees signing Pujols is that they’re set at first base, where Mark Teixeira plays Gold Glove defence, for the next six years. But if you really think positional preferences will prevent the Yankees from going all-in on Pujols, the best baseball free agent ever, you’re crazy. Especially when you remember that Hal and Hank Steinbrenner in their first offseason alone at the helm, were completely embarrassed during free agency this winter. Hal and Hank were hoping to forge a win-at-all-costs legacy for themselves by bringing in ace lefty Cliff Lee. Instead he spurned New York, and the Yankees also watched as the hated Red Sox brought in two more superstars, Carl Crawford and Adrian Gonzalez. The biggest move the Yankees made was bringing in a $35 million set-up man. 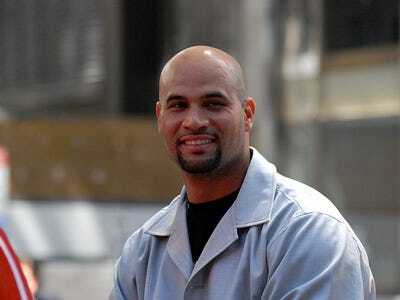 So here’s our bet: the Yankees will stop at nothing next year to sign Pujols. There will be no line in the sand for a contract number, and Teixeira’s hold on first base will be a non-issue. The only way the Yankees fail to get Pujols, is if he, like Lee, decides that he’d simply rather play elsewhere. If the Cardinals haven’t had the foresight to recognise that by not signing Pujols before the season, they’re about to enter into a bidding war with the Yankees, they don’t deserve to keep their slugger in the first place.